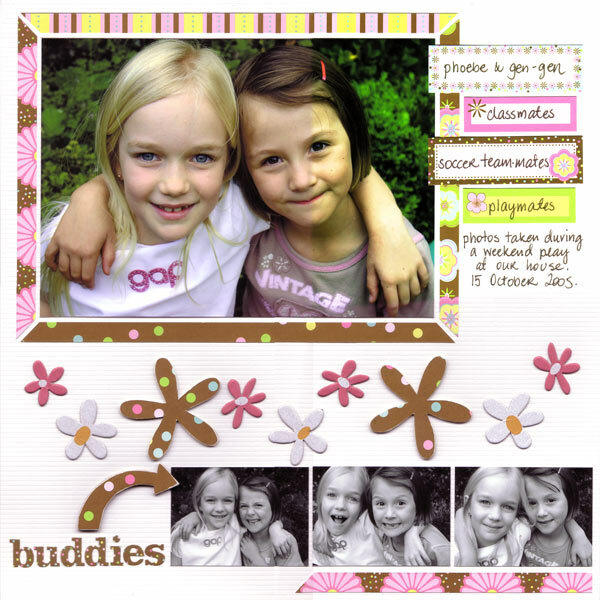 Finally scanned this layout from the latest Scrapbooking Memories. Paper Salon paper was used to create the large flower. All flowers (except the large one) are from the Paper Salon Bloom Builder Tailored Tin set. Just love that set. 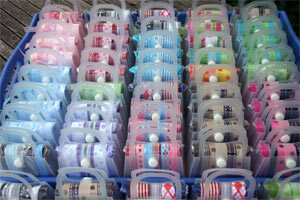 The letter stamps are also a Tailored Tin set. The two ribbons used as the borders are from Ribbons Galore. "THIS OLD HOUSE has been our HOME for the last 10 years. Built in the 1920's, we, the Carter Family, have been the occupants for one eighth of its house's life. We have put our own mark on this house, made changes to this house and its garden to suit our needs. A new kitchen was built to replace the old 1960's version we inherited with the house. We painted the walls, polished the floor boards and replaced old windows and doors. We have dug up a huge amount of concrete and rubbish from the front and back yards and created a garden for us all to enjoy. We worked hard to make THIS OLD HOUSE our HOME. 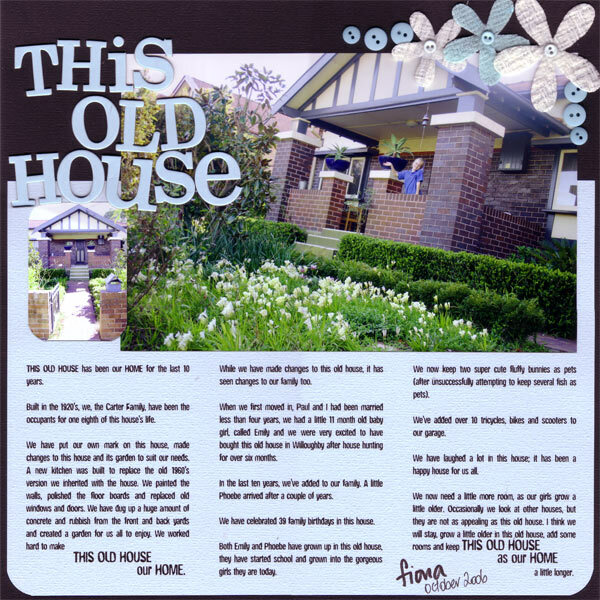 While we have made changes to this old house, it has seen changes to our family too. When we first moved in, Paul and I had been married less than four years, we had a little 11 month old baby girl called Emily and we were very excited to have bought this house after house hunting for over six months. 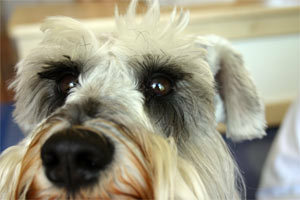 In the last ten years, we've added to our family. A little Phoebe arrived after a couple of years. We have celebrated 39 family birthdays in this house. Both Emily and Phoebe have grown up in this old house, they have started school and grown into the gorgeous girls they are today. We now keep two super cute fluffy bunnies as pets (after unsuccessfully attempting to keep several fish as pets). We've added over 10 tricycles, bikes and scooters to our gargage. We have laughed a lot in this house, it has been a happy house for us all. We now need a little more room, as our girls grow a little older. Occasionally we look at other houses, but they are not as appealing as this old house. I think we will stay, grow a little older in this old house, add some rooms and keep THIS OLD HOUSE as our HOME a little longer." 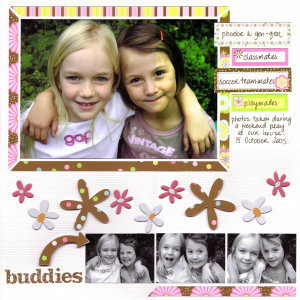 This is a layout from the latest Scrapbooking Memories. It is for our Disneyland Album, which I must keep working on. And yes, this is an 8 1/2 x 11 layout. The theme of the step by step for this issue was shimmer and shine. On this layout I've used golden metallic acrylic paint to paint the chipboard letters and metallic embroidery thread to stitch the Mickey Mouse ears on the right page. "To commemorate Disneyland's 50 years of magic, golden "Mickey 50 Ears" of all different sizes were hidden throughout the Disneyland Park. 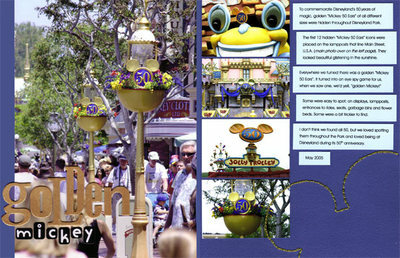 The first 12 hidden "Mickey 50 Ears" icons were placed on the lampposts that line Main Street, U.S.A. (main photo over on the left page). They looked beautiful glistening in the sunshine. Everywhere we turned was a golden "Mickey 50 Ears". It turned into an eye spy game for us, when we saw one, we'd yell, "golden Mickey!" Some were easy to spot; on displays, lampposts, entrances to rides, seats, garbage bins and flower beds. Some were a bit trickier to find. I don't think we found all 50, but we loved spotting them throughout the Park and loved being at Disneyland during its 50th anniversary. Well last night I taught a gorgeous group of ladies out at Scrapabout Australia. There were some familiar faces from previous classes and some new ladies coming to this class. Despite a few "supply issues" (I think there is a world wide supply shortage of the delicious HS chipboard clock faces) these ladies worked on their "Time Flies" layouts and constructed a little mini book during our time together. Thank you everyone for coming along to the class last night. So looking ahead to my other classes. I have one class in two weeks again on the Wednesday night. Then two classes in November on a Saturday. One of these classes is the KI Memories Trendy Tins class, and Leanne will be ordering the KI Tins and matching paper BY REQUEST. When you book into the class, Leanne will ask you to choose your colour tin and paper. If you are interested in coming to that class please contact Leanne sooner rather than later, so she can make sure the stock arrives in time. I'll pop some photos up in another post with more details of my next classes. A new Scrapbooking Memories arrived in the mail today. I have a layout in there with photos of some lovely scrapping friends, but I haven't yet scanned it. Soooo, I will do that soon and post. Remember the smashed mobile phone... well I'm the proud owner of a new PINK flip number (although it's not connected yet), but its been fun to play with so far. Hopefully this afternoon I'll be connected. But I would just like to ask, in the last few years (since I got my last mobile) when did they put so much in these phones? I've had it for days, and I still don't know what all the features are... camera, video stuff, MP3 player, internet, email, games (the girls love that one), there too much to take in, it'll take me years to learn how to use it. Anyway, off to bake a cake for afternoon tea. The girls have friends coming home with them this afternoon. 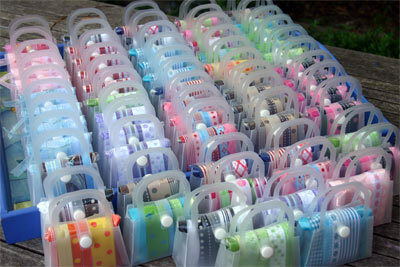 Ribbons Galore's Dolly Bags will be for sale during the Melbourne Paperific Expo. The Expo runs for three days from 27-29 October 2006 at the Telstra Dome, Docklands. 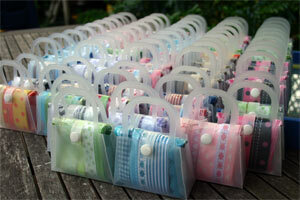 The Dolly Bags will be available from the Scrapanalia stand (stand 19) during the three days. For information about Scrapanalia, visit their site HERE. For information, opening times, etc about the Melbourne Paperific Expo, visit their site HERE. Two weeks of school holidays have been and gone. We've had a lovely relaxing break here in the Carter household. We've been to movies, the girls have had sleepovers, there's been a spot of shopping (well there are three girls in this house! ), we went to Luna Park one morning, there have been several coffee mornings spent at our local cafe (where on more than one occasion we seem to bump into friends) and we've been up at Hawks Nest for a little getaway. I love the holidays (I think I may have mentioned that before). I love that we get to catch up with friends who we don't see that often (unfortunately) through term time and spend some time with them. 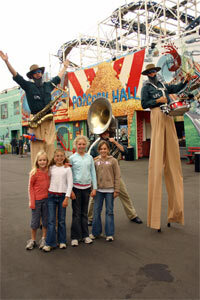 At Luna Park... 2 x 2 sisters (does that make sense?) Emily and Lucy, then Phoebe and Sophie went to pre-school together, and have remained good friends and still love spending time with each other. Not sure what Phoebe is giving the thumbs up to here. 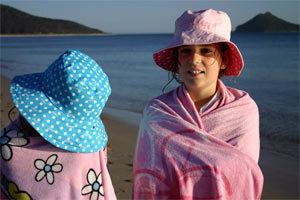 The snorkeling gear has become a permanent fixture on her face when we go to Jimmy's Beach these days. 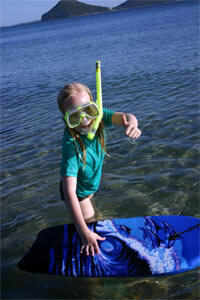 She's even mastered the art of coughing through her snorkel while underwater - lovely! That's about all from the holidays. 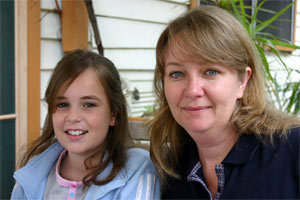 The girls are back at school, and before we know it, it'll be the Christmas school holidays. Thank you for visiting my blog. Have a fantastic week everyone. The new releases for Memory Trends are up, and very stylish. 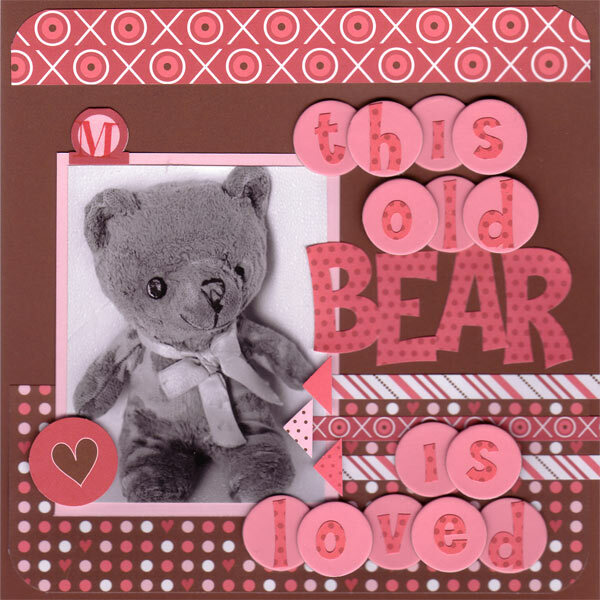 Here's a little project using the new Smitten collection being released at MT. Last week was a huge week in the Carter household. I'm not one to wish away time, but it is a week I'm glad to have in the past. There were some good things happening around here, but there were also a couple of other things I'm glad are over. Poor Phoebe had an expander installed in her mouth. The poor kid is struggling with her eating and swallowing, which I know given time she will get used to. There's a big piece of metal across the roof of her mouth, which just looks awkward. This is only the beginning, she'll be getting some braces soon on the bottom teeth, and then there were other things that will be installed over the next 6-8 months. I had an operation on Thursday. I'm feeling a bit better today, but I know the recovery takes a little while, and I'll be a bit sore and sorry for a time. The Swannies lost. And because I had my operation during the week, Paul wouldn't leave me with the girls to go to Melbourne and watch his team in their second grand final in a row. 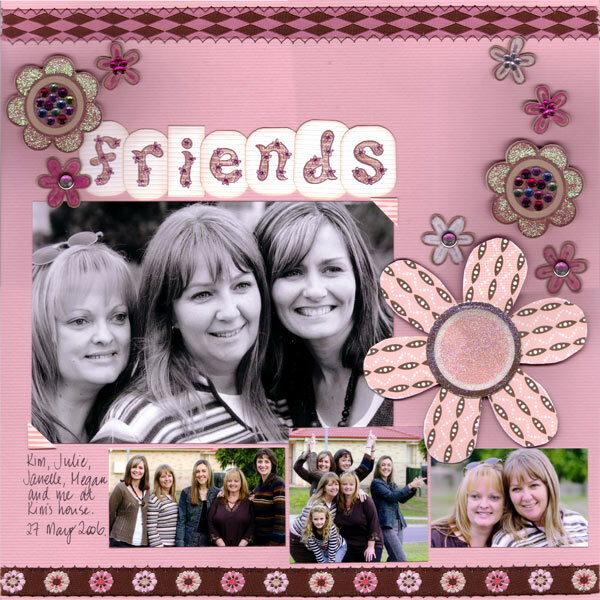 I had a lovely lunch with three girls I've got to know over the years through scrapbooking. 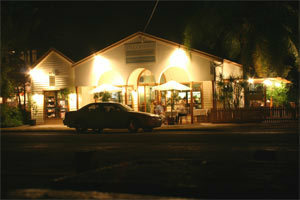 It was nice to catch up over some yummy tarte flambes (french pizzas) at my local cafe. Emily had a big project she's been working on this term. She had put so much work into this project. On Wednesday she gave her presentation, which she was pleased with. The latest Scrapbooking Memories arrived in the mail. When I opened the package there was one of my gorgeous girls on the cover with her friend. I had completely forgotten which issue it was, and it seems like only a couple of weeks since the last issue came out. So that was certainly an exciting surprise. This layout was completed as part of a Paper Salon challenge in the magazine. There is also a Ribbons Galore promotion in this latest Scrapbooking Memories, which was very exciting to see it in print. I got some lovely phone calls/emails from friends after my operation, and some gorgeous flowers - beautiful lilies which are still opening. 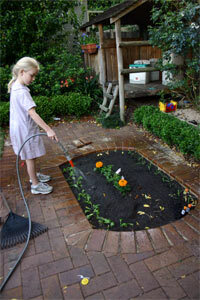 We converted our un-used sand pit into a vege patch. Phoebe and I planted some things into there beginning of the week, and already our rocket is looking good. Bring on summer salads!!! We went out for a lovely Sunday breakfast this morning. 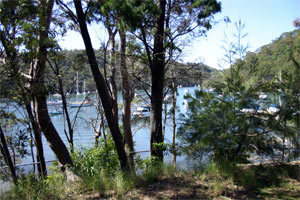 This cafe is part of a marina right on Middle Harbour here in Sydney. Just a beautiful spot to sit, chat, eat and drink coffee. AND ITS THE SCHOOL HOLIDAYS... I LOVE SCHOOL HOLIDAYS, AND I'M NOT EVEN AT SCHOOL. Have a good week everyone. Thanks for dropping by my blog.